This new standard defines three test charts. The new Imatest eSFR ISO module performs a highly automated analysis of the new low contrast (4:1) Edge SFR chart and is available in Imatest Master and Image Sensor 4.0. * Note: ISO 12233:2017 has the same chart requirement. Hyperbolic wedges: 4 vertical, 4 horizontal, and 2 diagonal (45 degrees). Vertical and horizontal (but not diagonal) wedges supported by the Imatest Wedge module, which has manual region detection. Low contrast Edge SFR (E-SFR) test chart Contains 9 slanted squares for slanted edge measurements. 4:1 contrast: much lower than the old ISO 12233:2000 chart (>40:1), which was found to cause problems with clipping and nonlinearities. This chart does not work with the highly automated Imatest eSFR ISO module, described below. For highly automated measurements (including squares near the corners, color patches, and wedges) we recommend one of the Imatest eSFR ISO charts shown below. These charts are fully compliant with ISO 12233:2017. Note: ISO 12233:2014 has the same chart requirement. Supported by the Imatest Star Chart module. Optional automatic region detection is available when used with a star pattern that has registration marks on the sides of the image. The old high-contrast ISO 12233 chart, shown on the right, is referenced in the ISO 12233:2000 standard but is no longer a part of the standard. It should only be used when results need to be compared with older work. Imatest eSFR ISO test charts come in three variants: Standard, Enhanced and Extended. All have enhancements over the chart illustrated in the ISO 12233:2017 document, but all conform to the standard. They are available from the Imatest store in inkjet, photographic paper, and photographic film media. 6 added squares on sides, 16 added color patches, several added wedge patterns. Sharpness is derived from edges at the boundaries of the slanted squares, as described in Sharpness: What is it and how is it measured? 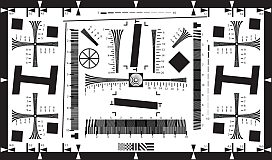 eSFR ISO can handle a wide range of camera aspect ratios; the left and right sides of the chart may extend beyond the frame or be well inside it. The Imatest Standard eSFR chart is very close to the chart illustrated in the ISO 12233:2017 standard document, with a few minor differences that maintain compliance with the standard. There are four registration (fiduciary) marks instead of three. An additional black circle, just above the lower-left registration mark, is used to detect orientation. This change was made because the projective transformation used for automated region detection requires four points. 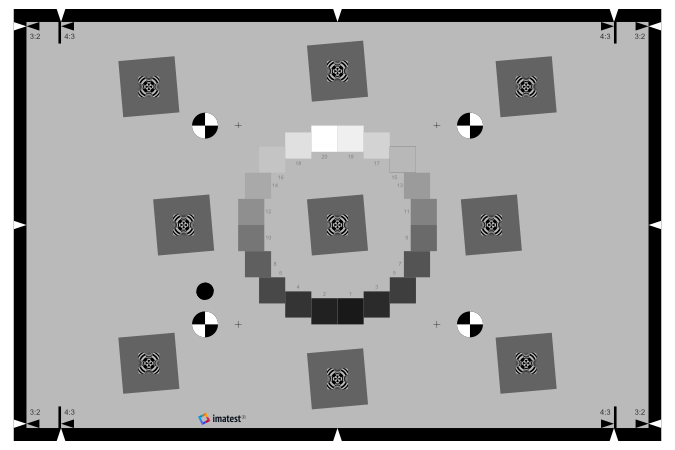 Annex C, Table C.1, row I of the standard states, "Asymmetric features for automatic target detection. These features should be placed within the 4:3 active area aspect ratio, but may be placed for convenience as dictated by use cases." A 20-patch OECF gray scale pattern is used. 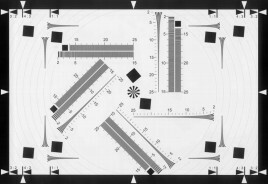 Annex C states, "The test chart also includes grey scale patches which are used to determine the OECF. While the example chart in Figure C1 uses 16 OECF test patches; a 20 patch version as described in ISO 14524 may also be substituted." The enhanced and extended charts add features to regions of the chart that are not specified by the ISO standard (but don't violate it), and which will be valuable to most users. Standard Closest to chart illustrated in the standard document. No added features. Cannot measure sharpness near the sides or edges of the image. Use only if required. The Enhanced or Extended charts are recommended for most purposes. Includes several hyperbolic wedges with properties similar to the ISO (CIPA) visual resolution test chart, which is supported (with manual ROI detection) by the Imatest Wedge module. 16:9 (Extended) 3:2 charts (Standard and Enhanced) are well-suited for DSLRs (3:2 aspect ratio) and compact digital cameras and camera phones (4:3 aspect ratio). The 16:9 (Extended) chart is well-suited for HDTV (16:9 aspect ratio) and for DSLRs (3:2 aspect ratio). 4:1 only 4:1 contrast is specified in the new ISO 12233:2014 (and 2017) standard. Pincushion pre-distortion is available for use with fisheye (strongly barrel-distorted) lenses. Available in matte surface only. See Pre-distorted SFRplus and eSFR ISO charts for Fisheye Lenses. Extra wedges Standard Enhanced and Extended charts have 4 pairs of low and high frequency wedges. 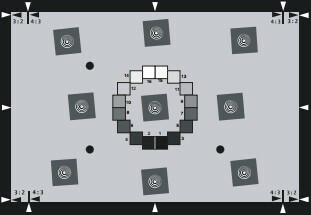 The version with extra wedges has at least 12 additional high frequency wedges: 4 near the center, 8 near the corners. Semigloss inkjet is slightly sharper and has a more accurate grayscale in the deep tones (print densities > 1.5) than matte inkjet, but is more susceptible to glare (specular reflections), especially with wide angle lenses. Matte surface is recommended for wide angle lenses. 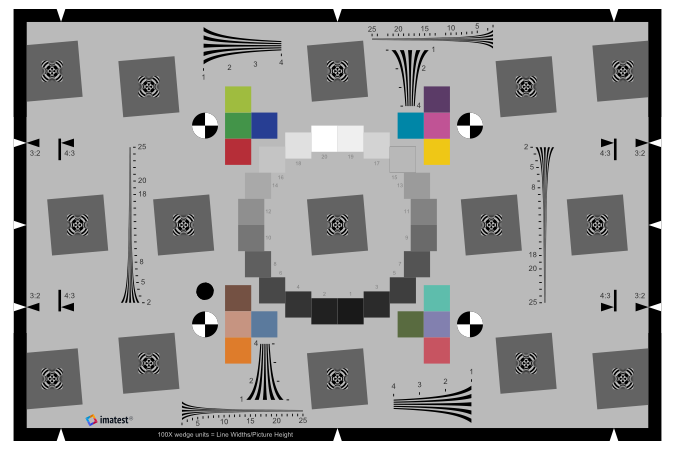 Photographic charts (reflective and LVT film transmissive) are much finer than inkjet: the same size chart is capable of analyzing much higher resolution cameras. Sharpness: expressed as Spatial Frequency Response (SFR) and also known as Modulation Transfer Function (MTF). Noise: measured from the grayscale patches surrounding the center of the chart, includes all types of noise calculated by Multicharts and Multitest (standard pixel noise, chroma noise, scene-referenced noise, sensor (raw) noise, and ISO-15739 visual noise). SNR (Signal-to-Noise Ratio) can also be displayed as a ratio or in dB. Tonal response (with less detail than Stepchart; no noise statistics yet). Color accuracy, when used with an eSFR ISO chart that contains the optional color pattern, located above the central square. Onset of aliasing and Moiré, measured from the four pairs of wedges in the Enhanced and Extended charts, whose spatial frequency range is the same as the separate ISO 12233:2017 wedge chart. Figures and results are identical to the Wedge module. All chart features— slanted-edges, grayscale patches, color patches, and wedges— are located automatically. Interactive/setup mode (run by pressing Rescharts or eSFR ISO setup in the Imatest main window), which allows you to select settings and interactively examine results in detail. Click on any of the thumbnails below (or on the image itself, repeatedly) to explore some of the many capabilities of eSFR ISO. Note the description below the image. Results are described in more detail in eSFR ISO Part 3. Note: the old ISO 12233:2000 standard and chart, shown on the right, is referenced in the new ISO 122433:2017 standard, but is no longer an official part of the standard. The new standard specifies three charts, one of which is a slanted-edge (Edge SFR or E-SFR) chart with much lower contrast (4:1; shown on the right, below). The new eSFR ISO chart has much less wasted area, especially in the Enhanced and Extended versions. About 90% of the old ISO chart is covered with patterns that have little value for computer analysis. Automated region detection, based on location criteria you enter. This makes the eSFR ISO chart and module well-suited for automated testing: with the old ISO chart, regions of interest (ROIs) had to be selected carefully whenever the image framing changed, even slightly. The 4:1 contrast edges are less likely to clip than the edges in the old ISO chart, whose contrast is specified at ≥ 40:1. 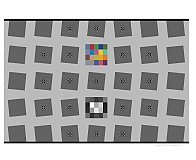 The camera operates in a more linear region, and hence results are more consistent and accurate— less affected by overexposure, underexposure, incorrect gamma estimate, or excessive software sharpening. 4:1 contrast edges are also more representative of real edges that affect perceived image sharpness. 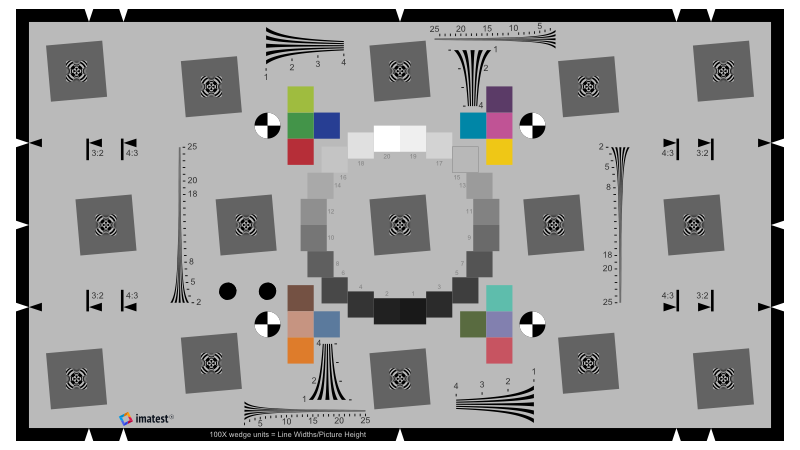 eSFR ISO can measure additional image quality factors, including lateral chromatic aberration, distortion, gamma (contrast), tonal response and color accuracy (in charts that have the color pattern). The old ISO 12233:2000 chart contains no information that can be used to measure gamma (the average slope of the Log pixel vs. log exposure curve. 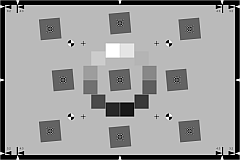 i.e., the contrast), which is needed to linearize the image for the MTF calculation. Accurate gamma measurement is particularly important with high contrast targets. In the eSFR ISO chart, gamma can be derived either from the individual squares (which have a known 4:1 contrast) or from the grayscale step chart. The map of MTF over the image surface has less detail. Distortion measurements are slightly less accurate (especially for the Standard chart) because there are no distortion bars and there are fewer features for measuring distortion. A detailed noise analysis (including all the types of noise measured in Multicharts and Multitest) is available. A Wedge analysis (including onset of aliasing and Moiré) is available. The standard chart has 4 pairs of added wedges. A version of the chart with at least 12 extra wedges (4 near center, 8 near corners) is available.